Brazil was hit by the seventh World Cup-related death yesterday after a worker fell at the stadium which will host the championship's opener in Sao Paulo. Fabio Hamilton da Cruz, whose age was not disclosed, fell about 26 feet while helping install temporary seats at the Itaquerao stadium construction company Fast Engenharia said in a statement. Firefighters said the worker fell from about 50 feet and press office of the Hospital Santa Marcelina in Sao Paulo confirmed the death, saying the worker did not survive serious head injuries. The worker was pronounced dead just before he was expected to undergo surgery. Details on the accident were not immediately released, but Fast Engenharia said the man was wearing all the required safety equipment at the time of the fall. Brazil's sports minister, Aldo Rebelo, released a statement lamenting the death and saying officials were awaiting results from an investigation into what happened. FIFA Secretary General Jerome Valcke said on his Twitter account that he was 'deeply saddened by the tragic loss of a worker." Deeply saddened by the tragic loss of a worker at Arena SÃ£o Paulo today. My thoughts and condolences are with his family & colleagues. FIFA and the local World Cup organizing committee said in a statement that they were waiting for the official report on the death. 'For FIFA, the LOC and the Brazilian authorities safety is paramount,' the statement said. The accident comes some four months after two workers died when a crane collapsed at the stadium while hoisting a 500-tonne piece of roofing. It was the eighth death at World Cup venues so far, the seventh in accidents. 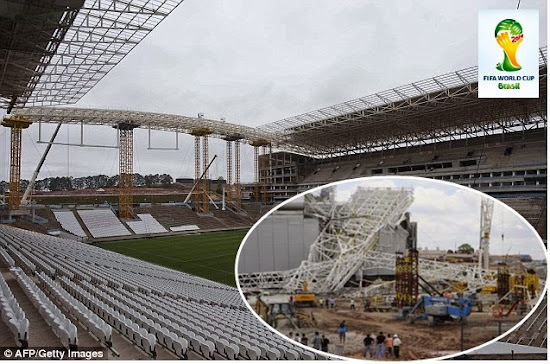 Three workers died in the Arena da Amazonia in the jungle city of Manaus, including a 55-year-old Portuguese man killed while disassembling a crane that was used to install the stadium's roof earlier this year. Another worker died at the stadium of a heart attack. In 2012, a worker died at the construction site of the stadium in the nation's capital, Brasilia. Construction was already behind schedule in Sao Paulo because of the damage caused by the earlier accident in late November, when the roofing structure fell on part of the stadium's facade. Although the venue was originally planned to be finished by 'early 2014' FIFA said it was expecting the venue to be finished in mid-May, around a month before the June 12 opener. It was not clear if Saturday's incident would prompt further delays. The stadium is also known as the Conrinthians Arena - after the football club that it is home to. The stadium is located in Sao Paulo's Eastern District, one of the city's most deprived areas. The area is home to nearly four million people and the building will have a capacity of 48,000 upon completion. The contract was valued at £226 million when work began. About 20,000 temporary seats were being added to the new stadium to increase its capacity for the high-profile inaugural match between host Brazil and Croatia. Construction at Brazil stadiums has been plagued by delays and three venues remain unfinished less than three months before the opener. The other two stadiums under construction are the Arena Pantanal, in the city of Cuiaba, and the Arena da Baixada, in the southern city of Curitiba. Brazil promised that all 12 stadiums would be ready by the end of last year but only six were completed by the scheduled date. All of the completed stadiums were used in last year's Confederations Cup, a World Cup warm-up tournament. Infrastructure work across Brazil also remains far from completed but authorities continue to insist that the country will be ready to host its first World Cup since 1950.